The original bell has a patent dated July 28, 1874 and was cast in a foundry in Perkasie, PA. It remained in use over the speakers’ platform until 1893 when the tabernacle was erected. It hung in the old bell tower that was on the roof section of the tabernacle. It would be rung at various times throughout the day starting at 5:30 in the morning and as late as 10 o’clock in the evening. During the depression camp meeting had rough financial years and the bell was sold to a Petersburg farmer for $300. It was stored in his barn. 60 years later, in 1999, the farmer agreed to sell it back for $400. It is now mounted and on display near the museum. The need for a bell was revived in 1948 and a bell tower was constructed. The city of Linwood presented a bell to be hung in the new tower. In 1998 Linwood officials wanted the bell back. They replaced it with the current bell which comes from an old town meeting hall in Dalmatia, PA. Louis DeBozier, an American bell craftsman made the bell before the turn of the century. In 1997 the bell tower that was constructed in 1948 was in serious need of repair. It was completely rebuilt of cedar by his family to the Glory of God and in memory of Harry E. Taylor, a cottager from 1944-1997. 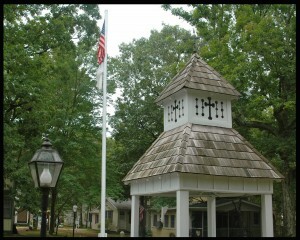 This bell hangs in the newly constructed bell tower and is rung for opening and closing of camp and call to services.